There’s no denying the fact that Adsense by Google is one of the best methods by which any blogger can monetize their blogs. However, there’s a catch. A lot of bloggers, every year, keeps on getting rejected by them in spite of applying properly. Wondering why this happens? Well, this is because their blog might not fill all the necessary criteria required by Google Adsense. However, there is nothing to worry about. Guess why? Because, there are numerous Google Adsense Alternatives, that can take its position. 1. Media.Net – This is one of the best Google Adsense alternatives that you will find in the market. This yahoo and Bing advertising network is pretty similar to the things that Google has to offer, and the earnings are equally tempting. If you want to give mobile ads, then that feature is also supported in this one. Wait till you hear the best part. Media.Net allows you to customize all the ad units according to your taste and blog. So the ad will blend in easily with the theme and color contrast of your blog. So give ad via Media.Net and earn a lot of money easily. • $100 Minimum Payout Threshold. • Net 30 days payout time. • Payment Methods Available: Wire transfer or PayPal. 2. Infolinks – Infolinks gives the bloggers a lot of earning potential. This ad network provides the pay per click feature on the ads, so even if one visitor clicks on your ad you will get money. This best Adsense alternative also offers in-text advertising so you can advertise via your writings. So whenever you wrote a blog, the keywords that you use will automatically get turned into links. If you have the space problem in your site then Infolinks is what you need because they take up really little space and their amazing feature automatically does the keyword to link conversion in your site, give it a try and you are going to love them. • They pay publishers 45 days after a the month ends if the applicable payment threshold has been met. • The payment threshold depends on the payment method you choose. PayPal, eCheck, ACH and Payoneer have a minimum payout threshold of $50 and $100 for Bank Wire Transfer. Want to earn money? Sign up here as a publisher. 3. Chitika – Thinking about the easy ways to make money online? Well with the help of Chitika a lot of bloggers have become rich. Yes, it’s possible. Chitika is similar to Google Adsense and it offers various local, mobile as well as search targeted ads that will target your readers. The best part about this Ad network is that the ads will be targeted to the customers who are interested in those products. So whichever visitor visits your blog they will see an advertisement according to their geographical location as well as interests. Since the interested people will see the ads, it is more likely that they will click in the ads and thus you will get money. So you can get a lot of monetized traffic and earn revenues from it. 4. Propeller Ads - It is a very good alternative for Adsense being one of the biggest CPM Ad networks. It pays for every 1000 ad impressions generated on a website. So it becomes necessary that ads get clicked. If a website has the stable and decent quality of traffic, then income is guaranteed through PropellerAds Ad. It acts as a good answer for newbies searching for how to make money online. Most of the accounts get approved here, and it is also very easy to get started. The good thing is that they share almost 80% of the ad revenue with the publishers. The payment is according to terms on Net30 having several payment methods like Payoneer, Webmoney, Wire Transfer, etc. As long their conditions and terms are fulfilled they accept any type of website. It is also compatible with other Ad networks and has no requirement for minimum traffic. You can monetize everything like websites, mobile, apps/extensions, social media traffic, and also 404 pages. • Payment Methods: PayPal, Bank Wire, Payoneer, ePayments, EPESE and Webmoney. 5. Buy Sell Ads – Buy sell ads or BSA lets you earn by selling spaces on your blog for ads. So you can directly sell these places to earn money. They are used by all the professional bloggers' out there who want to earn some decent money by blogging. There a lot of options for one to monetize. Examples are apps monetization, tweets monetization, cross monetization, mobile webs, and email monetization and so on. You will be amazed to see the plenty of features that they have to offer to the bloggers. Who says there are no Adsense alternatives for blogger? BSA is just the ad network that you need for your blog to grow and you to get money. With BSA you will be impressed by the number of alternatives they provide. • It pays its users through cheque and Paypal where the minimum payout requirement for cheque is $50 and $20 for Paypal. 6. Amazon Associates – Do you run a blog in which you talk about items that are found in Amazon? If yes then Amazon associates might work for you. Being one of the biggest online stores in the entire world, they will let you put an image-based ad on your blog. Whenever the people will read regarding that product, they might feel like buying and will automatically click on the ad. Even though it’s not according to pay per click basis, the good part is that whatever is sold from the link on your blog, you will get a monetary share out of it. Its irrespective of the stuff that they buy as long as it’s bought via your link you will get a handsome commission. So can there be a better Google Adsense alternative than Amazon associates? Well, there can be, but this one is definitely one of the best. They make the payment via cheque so that can consume some time, apart from this small drawback there are none. 7. PopCash – Cool name isn’t it? Well, their turnovers and benefits are cool as well. This ad networking site, you will know how to make money online easily. They are in the market for a long time so you can trust them by giving cash to you on time. They have a great CPM and will provide you with ads which are pop-under. They are friendly for mobile traffic as well as the desktop traffic and works in a lot of countries, their payment methods are quite attractive, which means there is no wait. You get the money transferred via Payza, Paypal or Paxum, whichever suits you the best. So if you need instant money by blogging, PopCash is going to be your way out, the money transferred by them usually takes lesser than two days. • Payment Methods: PayPal, Paxum or Payza. 8. RevContent – Revcontent has god some of the topmost ads in the industry. So if you need some high-quality ads in your blog, RevContent is going to help you out. They provide bloggers with native ads that are known to have a really high rate of engagement with the visitors. Moreover, they’re of related topics, so they blend easily with your blog. If you need pay per click feature, they provide extraordinary rates like 10 cents per click. Their advertisers come from all over the world so you will get attractive ads to feature on our very own website. They have got its referral process which will save you from the entire approval hassle. So tell your friend to refer you and sign up with that referral link to start earning right from today. 9. ClickSor – This Ad network is a popular Adsense alternative for blogger. They provide the contextual advertising feature which means that the ad will be related to the content that you publish in your blogs. The ads will be relevant to the kind of blogs you write and coming to the money, 60% if the generated revenue will go to the blogger. Great, isn’t it? The revenue potential with the help of this ad network is amazing, far more than you can imagine. There are numerous Ad formats which are offered to the bloggers for their ease. They are Graphical banners. Links, text banners, interstitial ads, pop-ups and so on. Choose whichever is the most suitable for your blog and add it. In no time you will find the visitors going to those ads and you will get the money from it. The best part about them is that you will get the majority of the ad revenue generated that is 60%. 10. Bidvertiser – It is a leading CPC or PPC ad network. It comes as a great adsense alternative if a publisher doesn’t get approval from Adsense or gets banned by adsense. It offers a bidding system for advertising on any site. The highest bidder gets to advertise on the website. So publishers may need to wait for some time before they can make some profit. 11. Ayboll – Ayboll is an ad network with a twist. They believe that giving normal ads on the blogs can ruin the experience for the readers. So they let the bloggers blog with a number of products that generate revenues. They will first let you identify the regions of the site which are most active and gets the maximum users. Next, you can choose various products like the native ads that blend so seamlessly with your blog that they won't look out of place. This way you can never ruin the experience for readers and announcement at the same time generate revenue via ads. There are exit popup ads which come into play while the user is leaving your site. No lengthy approvals, simply sign up, give the ad campaign and start earning money. 12. HilltopAds – This is another popular Ad network. The company was launched in 2014. It is ideal for experienced webmasters and beginner bloggers. The network provides various types of ad campaigns such as CPM, CPC, CPA, PPI and CPL with ad formats like popunders, display banners, in video banners as well as direct links. The network offers generous payment threshold that is only Net7. The minimum balance of $50 can be paid through PayPal, Bitcoin, Paxum, Webmoney, ePayments, Wire transfer and ePayservice. Another feature offered by the network for publishers is anti-adblocking. It is a great option for mobile carrier traffic publishers to help them reach every ad impression. The most popular verticals of HilltopAds includes dating, gaming, video streaming, file hosting, downloads, pin submits, entertainment and sweepstakes. • Payment Methods: Bitcoin, ePayments, Paxum, ePayService, Webmoney and Wire Transfer. 13. MadAds Media – MadAds media look really promising with attractive things to offer to the bloggers. They can easily replace Google Adsense with the help of the kind of service they provide. Various campaigns are provided my MadAds, and you can choose anyone from the ones that are provided. The common campaigns are CPC, CPA, CPL, CPM, etc. sounds exciting, right? Yes with so many options at your disposal it becomes easier to choose the one most suitable for your blog. With so many options to earn this is easily one of the best ad networks that the internet has to offer us. So don’t be sad if you did not get an approval from Adsense. With MadAds media you are likely to earn more than what you otherwise would have with Adsense. • Minimum Payment: The minimum payment amount is determined by you. 14. Yllix Media – There are various monetization options in this best Adsense alternative. They are simple, and so it is the best for beginners who want to get familiarized with the concept of ads and ad revenues. There are various types of Ads provided by Yllix Media like mobile redirections, pop up ads, layered ads, mobile ads, sliders and even full-page ads which will make sure that you make money when you work with them. They have a good CTR rate. One of the good sides is that you don’t have to wait for a long, long time to get an approval. Unlike Adsense, approvals here are fast and easy and won’t require your blog to have hi-fi features. So if you are a beginner in the blogging community and didn’t get the approval of Google Adsense, make sure you check out Yllix media. 15. Adsterra – A lot of big bloggers and brands are beginning to use this network. Adserra is growing in size with each passing day. They have a lot of innovative formats for the ads that are slowly gaining the reputation among bloggers. They are a way out for bloggers as well as for the advertisers who want to break away from the monotony of Google Adsense. You can monetize the traffic easily as their [platform is highly user-friendly even for the beginners. They have got the highest CPM that you will find on the market, and the fill rate is 100%. They are present in over 190 countries, and they have got active campaigns of around 20 thousand. There will be an account manager provided to you who will be at your disposal always. Call them any time of the day, and they will answer your queries effortlessly. They also offer the widest range of money transfer, online. • Minimum Payment: $100 and ($1000 for Wire Transfers). • Payment Methods: Bitcoin, Paypal, Wire transfer, Webmoney, Paxum, and ePayments. 16. Skimlinks – Even though 6the last one in the list, they are still amazing. The publishers get a lot of options for the monetization of content that is based in the e-commerce. So if you run a blog that focuses on e-commerce and various e-commerce sites, Skimlinks is going to be of much importance to you. Forget Google Adsense they have the option for affiliate marketing. There are various versions of Skimlinks, so if you have less space on your site, you can get the lite version and so on. You can insert the affiliate links provided to you in the content that you write and publish, and thus you will be able to attract more and more visitors to that link. Their payment is usually done on a monthly basis. The publishers that are working from UK or US can even get a cheque delivered to their doorstep apart from various online options. So easy and hassle-free are the two words that would rightfully describe Skimlinks. If you are tired of using Adsense and looking for something new, they are the best option you have go. Try them out today, and you will never want to go back to Adsense. So these are the top 16 Adsense alternatives for blogger. 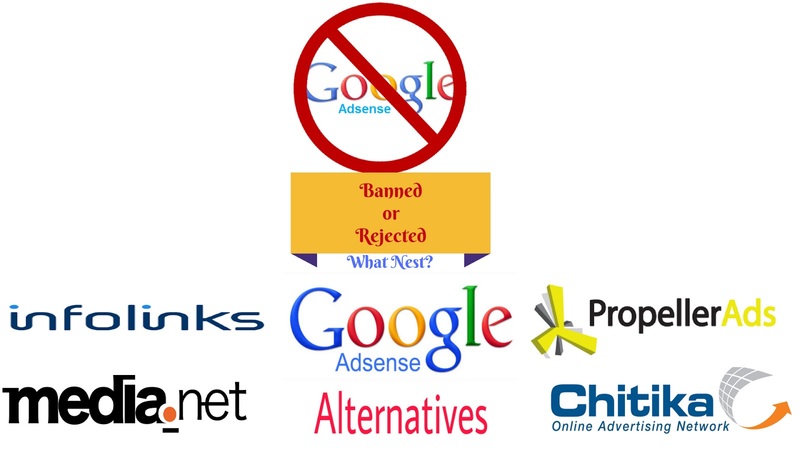 If you didn’t get an Adsense approval or if your account got banned these are the way out for you. If your account got banned or you didn’t get the approval from Adsense there’s nothing to think like it’s the end of the world as some of these alternatives are even better in all respect as compared to Google Adsense. Greater revenue, more varieties of ads, increased traffic and geographical ads, there’s much more than you can even ask for. Now that you know them, its time you implement them as soon as possible and earn a lot of money just by blogging. Didn’t you always wonder how all the bloggers made tonnes of money just by blogging? This is the secret that you were waiting for so long. These 16 alternatives are goldmines and they will make your career as s a blogger bloom to its fullest. Now that you have the way out its time you implement it on your very own blog. So why wait for the perfect time? Create an account today and get the amazing benefits and loads of money. nice article on Best Google Adsense alternatives. I am Jack Mike working with Quickbooks Tech Support..Facing quickbooks unrecoverable error? Call QuickBooks® Error technical support number to troubleshoot QB issue. Our QuickBooks® error customer care number is dedicatedly open 24x7 to fix QB errors.